Probably my favourite session at SQLBits the other week was Professor Mark Whitehorn on exploiting exotic patterns in data. One of the things he talked about was Benford’s Law, something I first heard about several years ago (in fact I’m sure I wrote a blog post on implementing Benford’s Law in MDX but I can’t find it), about the frequency distribution of digits in data. I won’t try to explain it myself but there are plenty of places you can read up on it, for example: http://en.wikipedia.org/wiki/Benford%27s_law . I promise, it’s a lot more interesting that it sounds! There’s not much to say about this code, apart from the fact that it’s a nice practical use case for the Table.Partition() function I blogged about here. It also references the first query shown above, called Benford, so that the expected and actual distributions can be compared. You can download my sample workbook containing all the code from here. Fascinating example! I wonder if it also might be useful for working with generated sample data. For example, you could validate existing actual sales data to see what the adherence is to Benford’s law, then use that distribution as part of creating sample/random sales data. 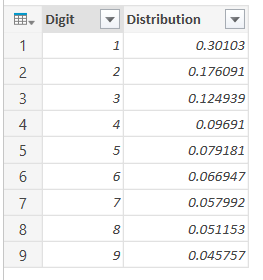 There are other ways to create randomized sample data off of existing data, but if you wanted to create samples for something that didn’t already exist (like a new market or new product), you’d have a better starting place if you new the distribution for existing numbers. Yes, that’s a good idea. 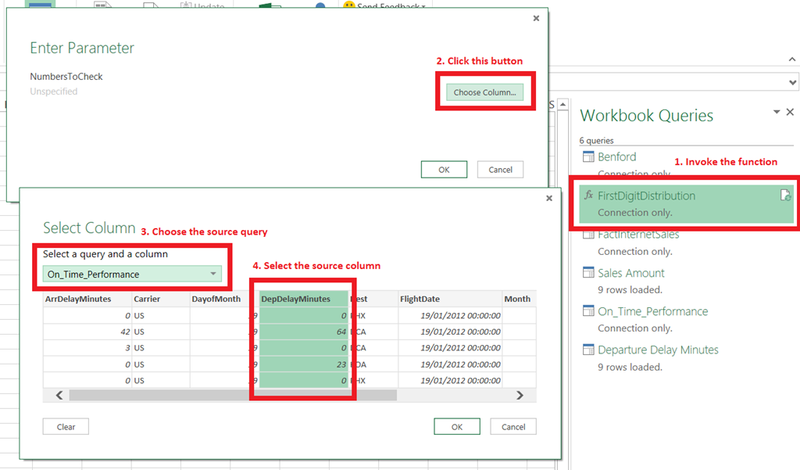 In fact using Power Query to generate random data is on my list of things to blog about, so I’ll bear that in mind. This is great way to plot the information! My next question would be how to drill down on this information to see what exactly the outliers are? Do we need to link relationships to the function?